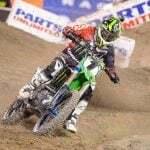 A crowd of 62,217 fans in East Rutherford, N.J. witnessed the coronation of Ryan Villopoto as the 2014 AMA Supercross Champion. 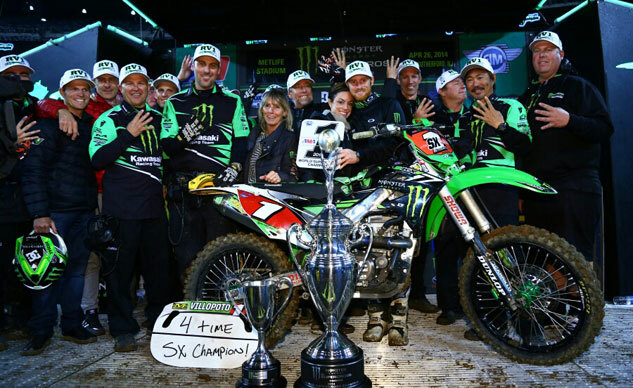 The Monster Energy Kawasaki rider took the holeshot and led very lap in a decisive victory to clinch the championship, his fourth in a row. 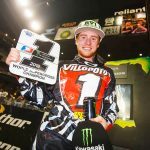 Villopoto becomes just the second rider to ever win the premiere class championship in four consecutive years; Jeremy McGrath was the only previous rider to do so, pulling off the feat from 1993-1996. Villopoto jumped out at the start to grab the holeshot for the first-ever Supercross round at MetLife Stadium. RCH Soaring Eagle Suzuki rider Josh Hill was second followed by Smartop Motoconcepts Suzuki‘s Mike Alessi after the first lap, while Villopoto’s usual championship rivals, the Redbull KTM duo of Ryan Dungey and Ken Roczen and Yoshimura Suzuki‘s James Stewart, were all well back of the leaders. Of those three, only Stewart had a mathematical shot at catching Villopoto for the championship, but a lot of things had to go his way for that to happen, as the reigning champion only had to finish 18th or higher to cement the title. With Villopoto’s quick start, the championship was by all but decided. By the end of the first lap, Villopoto had already built up a two-second lead, a gap he would build up over the ensuing laps into a ten-second cushion. From there, it was a comfortable win for Villopoto to clinch the title. Hill held onto second place for the first four laps before he was passed by Eli Tomac. The Geico Honda rider would stay ahead of Hill the rest of the 20-lap race to claim second. The news was less positive for Monster Energy Kawasaki in the 250 Eastern Regional class with news of incoming points leader Martin Davalos breaking his ankle during practice earlier in the week. His teammate Blake Baggett was also sidelined after suffering a laceration above his eye after being hit by a rock during training for the Motocross season. The third Monster Energy Kawasaki rider Adam Cianciarulo had withdrawn from the season to undergo shoulder surgery after twice dislocating it during the Toronto round. 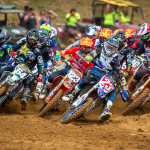 The three riders had combined to win six of the seven Eastern Regional rounds and 15 of 21 total podium finishes coming into the New Jersey round. With the three Kawasakis out, it was a wide-open 250 class race. 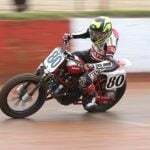 Honda rider James Decotis took the holeshot and led the opening three laps before going down in a tussle with Matt Bisceglia of Geico Honda. Bisceglia led the next three laps before he lost the lead to teammate Justin Bogle. Bogle would hold on for his second win of the season, with Yamaha‘s Jeremy Martin taking second ahead of Honda rider Vince Friese. The 2014 AMA Supercross season heads back west for the season finale at Sam Boyd Stadium in Las Vegas, Nev. with both East and West regional 250 classes in competition along with the 450 class.